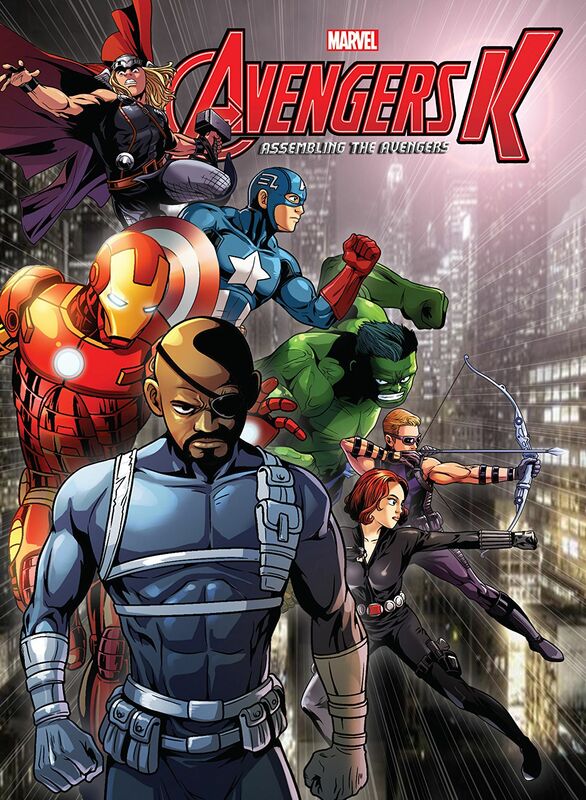 Be a Comics Globetrotter: 'Avengers K – Book Five: Assembling The Avengers' Review – AiPT! The Avengers are a bit different in Korea and it’s immediately obvious after reading Avengers K Book Five: Assembling The Avengers. The last volume was a retelling of the Secret Invasion storyline for a Korean audience, which was then translated into English. The same thing was done with this volume, only it retells how the Avengers were formed in one 166 page volume. Clean manga art telling the story in a streamlined way–what could be bad about that? If you’re like me, you’re probably curious how the stories we know and love are changed for a different cultural audience. It’s also quite fascinating how this volume ties into the Marvel movies and is more closely related to that universe than the comic book version. Given this is the fifth volume it might seem odd they’re just now telling the Avengers story, but it’s a neat way to get a slice of each hero into one package. This panel looks like it came straight out of an anime! Printed in an oversized format, this book screams manga in every page and panel. The characters have a somewhat childlike look with round faces and smaller bodies, which certainly gives the book a different feel. Told via character-focused chapters, this volume starts with Captain America fighting off Hydra before going into the ice and follows each team member and how they were brought in by Nick Fury. S.H.I.E.L.D., Agent Coulson, and Nick Fury act as a center to the story with these characters popping in and out as they discover new threats and bring their attention to the heroes. The flow generally works–especially if you’ve seen the movies–and builds towards Captain America finally being rescued from the ice. If you’ve read Marvel comics for a while or seen the movies, much of this volume is going to be familiar to you. It actually touches on Hawkeye encountering Thor after losing his hammer just like in the Thor movie. Hulk’s relationship to General Ross springs up just as it did in the Edward Norton-lead Incredible Hulk film, and Whiplash even makes an appearance as he did in Iron Man 2. The creators have managed to tie all of this together in one volume in an easy to follow way. Fury is attempting to find the tesseract and his search actually ties well with each heroes’ purpose in this volume. The art is good, though simplistic and much more manga-like than many might expect. The usual manga features can be found here, like a drip of sweat to convey stress or shocked, mouth agape faces. Layouts are rather basic with mostly three or four panels per page which gives the book a slower feel. There isn’t a ton of reading so the images have to do a lot of the work. That makes the reading experience feel like it’s for younger audiences. Back when Cap was actually fighting Hydra. The simplicity of the art carries over in the storytelling, which is quite simplistic and lacks the character work that could give this story meaning. It reads much like an overview or outline to the films. If you’re looking to give this to someone who is familiar with the films and is interested in a brisk read that connects them all they may love this, but by the end it’s not complex enough. The chapters also leave a few gaps that are perplexing. Take for instance Thor, who at one point is sulking after not being able to lift his hammer and then a few pages later is in full Thor gear wielding Mjolnir and working for S.H.I.E.L.D. Unless there are some missing chapters not included here the story feels incomplete and can even feel jarring. It’s another element that makes this read more of an overview than an in-depth drama. Avengers K is an interesting series of graphic novels as English speaking readers can get a taste of what Korean Marvel comics are like. The manga style art sets it apart and this volume connects the movie universe stories well, but it’s also a quick read that suffers due to the overview nature of its storytelling. This is a good book, but one that only casual readers may love. It has an interesting overview take on the Marvel movie universe characters, but lacks the complexity and cohesiveness to make it truly enjoyable.